It was perhaps appropriate that the all-candidates meeting for Madawaska Valley took place in a hockey arena. 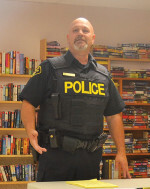 The Ontario Provincial Police believe that home-owners can definitely take steps to make their home less “thief-friendly”. If the Ontario Trillium Foundation approves their proposal, Highlands East could have a new food bank space, more access to food for those in need and more cooking classes and food programming. I have just received Daryl Kramp MP most recent communication with his constituents entitled: What Do You Think? As fall turns to winter members of the Bancroft & Area Adopt-A-Child committee are gearing up for the 25th annual Adopt-A-Child winter snowsuit program. For the past 24 years, this program has provided warm winter clothing for the children in the North Hastings area. Speaking with local farmer Jarrett Switzer about his love for growing food at his family’s farm on Clear Lake Road in Bancroft, it was great to see how passionately connected he was to his work. The former Wilberforce library will have a temporary new resident in the form of the food bank in the next few weeks. After watching a three-hour hard downpour of rain at Millennium Park in Bancroft on Sunday Sep. 21, organizers of the local Peoples Climate March were literally stunned that less than five minutes before their march start time of 1 p.m., the rain stopped and the sun came out. 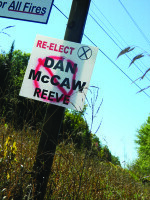 With the municipal election contest underway, evidence of theft or damage to election signs has reared its ugly head already in Wollaston Township, as well as other nearby municipalities.